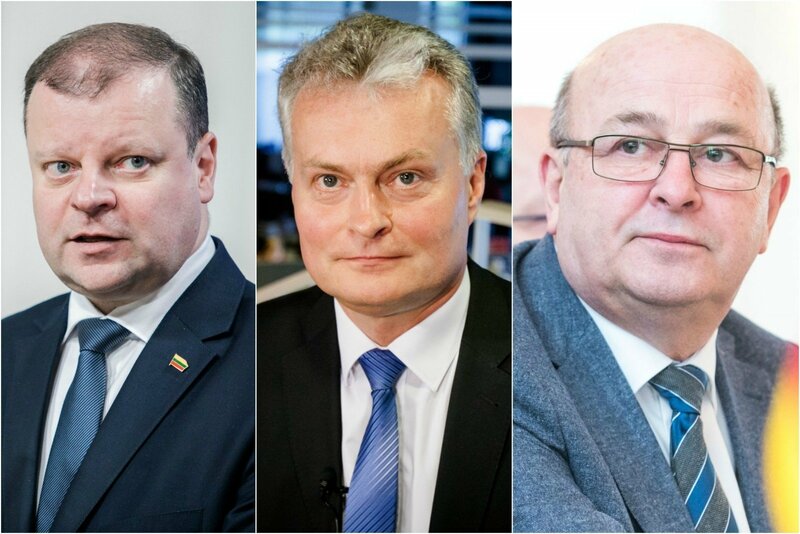 The citizens of Lithuania currently would see three men in the post of president – Prime Minister Saulius Skvernelis, Kaunas Mayor Visvaldas Matijošaitis and economist Gitanas Nausėda according to the most recent Spinter Tyrimai survey. Analysts note a clear split in society – S. Skvernelis is seen as the candidate of the "common people" while G. Nausėda is far more favoured by the elite. These are the trends revealed by the a survey performed by the public opinion and market research company Spinter Tyrimai commissioned by Delfi. If the presidential elections were held this coming Sunday, 14.7% of respondents would choose S. Skvernelis' candidacy, 11.9% of respondents would opt for V. Matijošaitis and 10.5% - G. Nausėda. 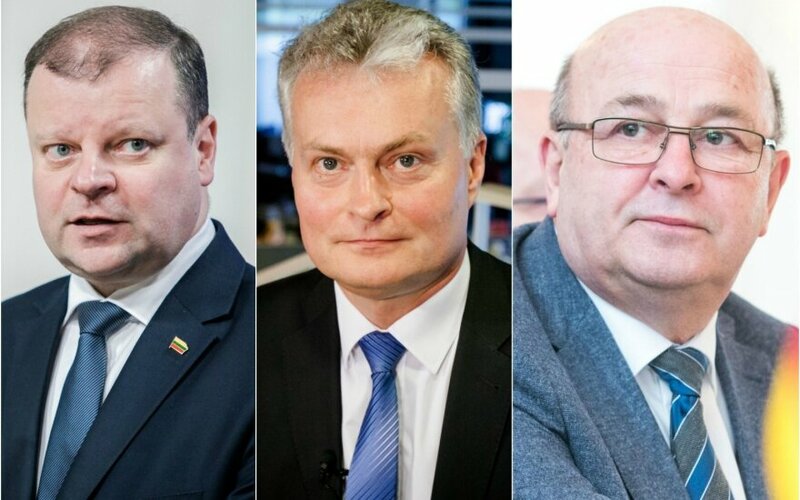 Next on the list is former European Union ambassador to Russia Vygaudas Ušackas (7.3%), Lithuanian Farmer and Greens Union (LVŽS) chairman Ramūnas Karbauskis (6.7%), MP Ingrida Šimonytė (6.1%) and MEP Vilija Blinkevičiūtė (5.8%). 4.3% of respondents would support journalist Andrius Tapinas, however he has recently declared he would not seek the post of president. Spinter Tyrimai notes that S. Skvernelis would more often be supported by middle or lower education, middle or lower income representatives, residents of regional centres and rural areas, 46 years or older. Meanwhile G. Nausėda is more favoured in Vilnius and the other major cities, among voters aged 36-45, higher education and higher income. V. Matijošaitis is more popular in the major cities (particularly Kaunas, Panevėžys and Šiauliai) and the regional centres, among those aged 26-45. Does this suggest a struggle between the representatives of the elite and "common people"? Vilnius University Institute of International Relations and Political Science (VU TSPMI) professor Tomas Janeliūnas says that the split of elite and common people is "fairly tangible". "This should probably surprise no-one even if we, say, compare S. Skvernelis and G. Nausėda, it is clear that the prime minister grew his popularity this way – by having more supporters among the segment where incomes and education are lower. His entire image was formed to attract such a simpler voter. Meanwhile G. Nausėda, one way or another, is essentially viewed almost a representative of the elite. His thematic were clearly concentrated toward business circles, he will likely have difficulty escaping it," T. Janeliūnas stated. The political scientist explains that V. Matijošaitis' image is different to S. Skvernelis, but one way or another they are both comparable politicians seeking to aim at the simpler people. They both aim to attract those who favour more down to earth politicians. TSPMI professor Ainė Ramonaitė notes that recently a gap is surfacing between the residents of big cities and the province. This, she notes, is linked with many factors, including a general mood, the province's feeling that those living in the cities live otherwise and do not understand them, have little interest in their issues. "Of course we can ask why specifically G. Nausėda is on the side of the cities because he also talks about the need for more attention for social problems. But S. Skvernelis is simpler, more understandable with his rhetoric, in a certain regard he reflects a desire for order, he is associated with a firm style of governance, while G. Nausėda – with academic argumentation, intelligentsia stance. Thus he is not completely acceptable in his style to those who want problems to be resolved quickly, here and now, not through lengthy academic debate," the professor explained. A. Ramonaitė believes that there are still many variables with the coming elections, but what is most important is what the parties will say, particularly the Homeland Union – Lithuanian Christian Democrats (TS-LKD) and the Farmer Greens. "I believe G. Nausėda could be a fairly strong candidate if he were to receive the support of a strong party. In the end it is even technically difficult to just gather the signatures for candidacy, not to speak of an electoral campaign and such," she noted. That said, the political scientist points out that the Conservatives are talking about their own candidate, thus it is a question who could support G. Nausėda. "V. Matijošaitis is an interesting case, but I could hardly believe that he could reach the second round by his own efforts, without a major party. I would doubt it. (...) In the end I would be inclined to believe that the best chances would be for the candidates of the TS-LKD and LVŽS. Especially if the people are non-partisan, but instead personalities who are appealing to the broad part of society, while also having party support," A. Ramonaitė said. "V. Matijošaitis seems to respectively be evaluated as a manager, who takes care of earthly matters, taking care of Kaunas, the residents of other cities watch this with a degree of envy. The image of someone who is orderly, enjoys order will always be appealing to voters; in this case V. Matijošaitis likely has a niche to attract people who once liked Brazauskas and who now also want a politician in a similar vein," T. Janeliūnas commented on the Kaunas mayor's chance to become president. According to the political scientist, the parties will have to clearly decide on a single candidate, while the Conservatives and Social Democrats may even hold primaries. This decision, T. Janeliūnas guesses, will remove a good number of currently mentioned candidates who have neither party support yet, nor have made up their minds. "However this certainly does not mean that it is only party representatives or those with party support who can win the presidential elections. In recent decades we have seen the opposite trend – people like candidates who are not directly linked to parties. Both Dalia Grybauskaitė and Valdas Adamkus were valued specifically because they were not strongly linked to parties," the political scientist said. According to him the explanation is simple – people do not like parties, they seek specific personalities. If a personality appears which manages to appear a different politician than traditional party representatives, they will have a big advantage. The public opinion and market research company Spinter Tyrimai held a survey on October 20-26, 2017 on commission by the news portal Delfi. Citizens aged 18-75 participated. The survey was held as a standardised interview. The research was performed across Lithuania at 65 locations distributed to represent the country's entire territory. During the research 1007 respondents were interviewed. The distribution of research participants is proportionate to the number of residents in the country's regions. The research error is 3.1%.